Income tax return filing is mandatory if your income is exceeding tax exempted limit. This year government has introduced the facility of EVC to e-verify electronically filed returns. Last date of filing the income tax return is 31st Aug 2015. You must be ready to filing your income tax return. If you are filing income tax return for the first time you must take extra precautions while filing income tax return. In order to help you, I am here with 20 common mistakes you should avoid while filing income tax return. Quoting wrong PAN number means your income tax rerun will be filed on someone else name. You should recheck your PAN number twice before filing your income tax return. You should select correct ITR form for filing income tax return. Specific ITR form is defined for the specific purpose. Filing return with incorrect ITR form may lead to rejection of ITR. You should enter correct bank account number while filing income tax return. Entering an improper Account number or IFSC code means delay/problem in getting a refund. One must report the detail of all exempted income like dividend income, income from long-term capital gain etc. There is popular misunderstanding that these incomes need not to be disclosed in ITR. However, these details are easily tracked by income tax department via your PAN card number. If you are salaried you should report these incomes to your employer before generation of form 16 to incorporate these details in form 16. You should report extra income earned by you during the financial year without fail. Extra income source could be consultancy, selling products, affiliate income etc. Your form 16 might not contain these incomes. You should check form 26AS (Your tax credit statement) before filing income tax return. This is to ensure that the TDS deducted on behalf of the taxpayer by deductor is actually deposited with the income tax department and you are filing a return with legitimate information. It is important to pay remaining taxes before filing income tax return. Filing income tax return without paying taxes will lead to rejection of return. Remember that maximum deduction allowed on interest income of saving bank account is 10,000 Rs. (Section 80TTA). Interest income exceeding 10,000 Rs/- will be taxable and you should report this income. Another common mistake which people make is not reporting income from the second house/property. The second property which is not self-occupied is by default assumed as let out property. You need to add rental income from this property in your income. If you are filing income tax return for the first time you are likely to make this mistake. Under form 16 you will find salary in “Income chargeable under head salaries” while in ITR you will find simple title “Income from salary”. 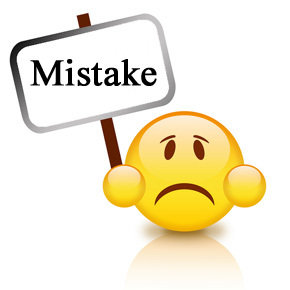 Another common mistake which people make after submission of ITR is not verifying return. This year onwards you can e-verify your income tax return by EVC. Another alternative is to send the physical copy of acknowledgment at CPC, Banglore within 120 days of filing income tax return. If you are not verifying return after submission your ITR will be considered as defective. Another common misconception is one cannot revise return if mistake is made in original return, but it is not true. You can submit a revised return before the expiry of one year from the end of the relevant assessment year or before the completion of assessment by the income tax department, whichever is earlier.Thus return of A.Y 2014-15 can be revised till 31st March 2016 or before the completion of the assessment whichever is earlier. You can revise return provided you have filed original return before due date. You can file income tax return after due date also. Income tax department allows you to submit income tax return anytime before the expiry of two years from the end of the financial year in which the income was earned. Common confusion for the new taxpayer is – “Filing return is not mandatory if I have paid all my taxes and no refund is due”. However it is not correct Income tax return filing is mandatory if your income is exceeding tax exempted limit. If you have invested money on the name of child you need to club this income with your income. Remember that Assessment year and the financial year is not same. Financial year always starts from 1st April and ends on 31st March. Assessment year is the year immediately after the financial year. For FY 2014-15, Assessment year will be 2015-16. If you are changing job frequently you might have got multiple forms 16 in one financial year. Although you have got multiple forms 16 in one year you need to file only single Income tax return. You need to provide a correct e-mail address and postal address while filing income tax return. Any information or notification sent by income tax department will be sent to address mentioned in income tax return. If you provide a wrong address you might not receive important communication from Income Tax department. Income from the fixed deposit is taxable and you need to mention the same in income tax return. Bank will be sending information about TDS on FD to income tax office on your PAN number. Not mentioning detail may lead to the discrepancy and may lead to rejection of income tax return. If you encounter any mistake in return you need to submit complete income tax return and not just the schedules/filed that require change/correction. Making mistakes mentioned above while filing income tax return means inviting income tax department for notice, scrutiny or penalties. Avoid them to have a spotless tax record. 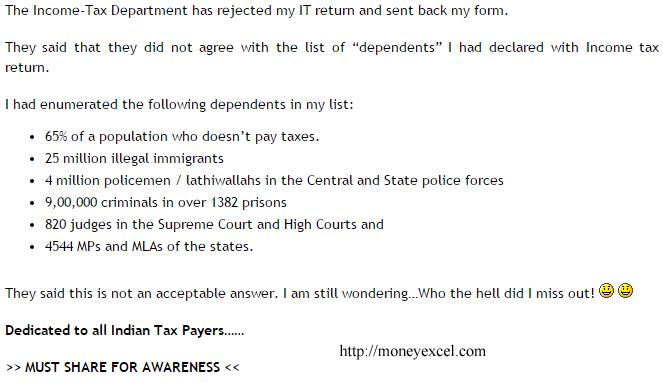 At last I would like to share Joke on Rejection Income tax return. Hi, I am NRI senior citizen and going to retire and return back to India permanently with my wife. I have made few FDs jointly with my wife. Half of these FDs have my name as the first holder and my wife as the second holder. Similarly remaining FDs have my wife as the first holder and I am the second holder. Now, being NRIs we have not filed any Income Tax returns so far. Now, can we file separate income tax returns showing interest earned from FDs with my wife as the first holder as her income? And the remaining (where my name is the first holder) as my separate income? I would very much appreciate feedback. You can file Income Tax Return for showing interest earned for FD for your and your wife name.If your income in India is exceeding taxable limit it is mandatory to file income tax return.To file income tax return you need to have PAN card number.